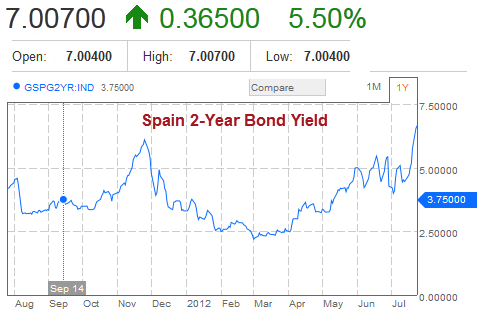 Those wondering when the yield on Spain's 2-year government bond would exceed 7% now have an answer. Today is the day. Note: the lines on the charts below reflect yesterday's close. The numbers in green accurately reflect today's price movements. Of further interest please note the inversion at the long end of the curve. 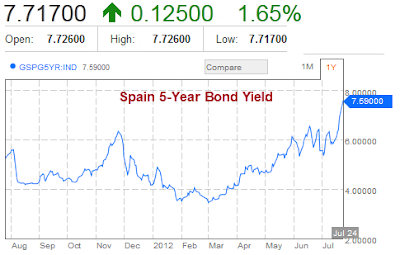 The yield on 5-year treasuries now exceeds that on the 10-year treasury. The inversion is slight but the massive yield increase on the shorter end is significant. 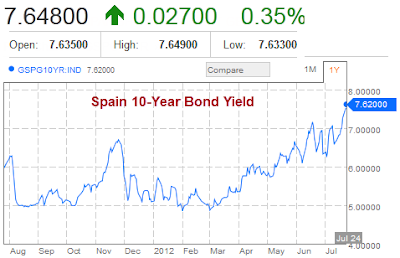 If this action continues, and I expect it will, the market is pricing in a sovereign debt restructuring of Spain, including bond haircuts.